For Michael O’Neill, the next few years can only bring the rise and rise of Josh Magennis. Northern Ireland’s manager has made no secret of his admiration for the forward and says that Magennis’ bright start to his Charlton career is no surprise. Magennis joined the League One club from Kilarnock in the summer for a potential £250,000 fee and his strike against Oldham on Tuesday night was his second in nine league appearances. “I thought Josh would do well,” said a proud O’Neill. “He’s made for English football - his physical attributes and his attitude to it. “Josh is a player that I believe is on a constant upward curve. In the last two years at Kilmarnock, Josh came on immensely because he was playing. “At Aberdeen, sometimes he wasn’t playing, sometimes he was playing full-back. The 26 year-old has 23 international caps and, although he has scored only one goal, O’Neill reckons his performances for Northern Ireland have helped him progress at club level. 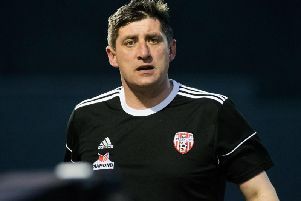 “We realise how difficult it is for Northern Ireland players to make a career in the professional game now so if we can assist them in any way, I think that’s part of our job,” he said. “I’m delighted for Josh because I was close to the frustrations he had in Scotland. Watching Michael McGovern play consistently for Hamilton as well, to establish himself as Norwich’s number one keeper is fantastic. Before his move to Kilmarnock in 2014, Magennis had been struggling for game time at Aberdeen, from where he was even shipped out on loan to St Mirren. Now experiencing the frustration of being largely confined to the bench is Kyle Lafferty. Lafferty has played just 26 minutes of Championship football for Norwich so far this season.